In TheraNest, you can bill by service rates or bill by income. Click Organization > Settings from the left sidebar. Click the Service Types tab. Here you can Add or Edit different services you offer and the rates as well as CPT codes and Units. If you want the codes to show on invoices, add them in the service type name. Each service and rate will show to the right. Go to Settings > Organization > Profile tab. Change your billing type to Income Based under Bill clients by: field. Be sure to click Save to save your changes. 3. After saving, go to the Income Based Payment Amounts tab. Enter payment ranges starting with the lowest pay range first, add as many ranges as you need, and click Save. 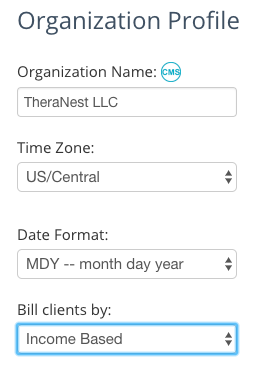 Note: You can set a default payment amount for an individual client on the Client Details page. Just enter the default amount in the Set Payment Amount field and click Save. This amount will override the Payment Ranges or Service Types set organization-wide when you create an invoice for this client. Of course, you can still enter any amount you want during invoice creation.